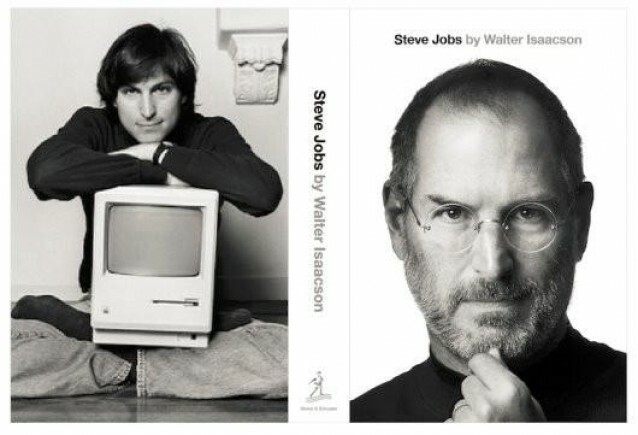 The Albert Watson photo graces the cover of Walter Isaacson's biography of Steve Jobs. Following this morning’s new that the authorized biography of Steve Jobs had rocketed up the Amazon book charts, its publishers, Simon & Schuster, have announced that the title’s release date has been brought forward to October 24. Simply titled Steve Jobs, the book is written by Walter Isaacson, and was originally scheduled to ship on November 21. Just this morning we reported that the pre-orders for the book through Amazon had soared by a staggering 41,800% to take the book to number one in the chart — from position 419. Now, AllThingsD reports that we won’t have to wait as long to read about Steve’s life in the words of the man himself. The book is now scheduled to launch on October 24, and is based on over 40 interviews with Steve himself, and over 100 interviews with Steve’s friends and family. The book was still being updated this August to reflect Steve’s resignation as CEO. The Wall Street Journal reports that Isaacson’s last interview with Steve was around four weeks ago, during which Steve reportedly conceded that he knew he was going to die soon. That interview will be included as a scene at the end of the book. Isaacson’s book will be the most personal account of Steve’s life to be published, and is destined to be immensely popular all with fans of both Apple and Steve the world over. You can pre-order the book now via Amazon or the iBookstore.